Savute Elephant Camp is located on the Savute Channel in Chobe National Park, which is in the rugged, semi-arid wilderness region of far northern Botswana. Chobe is famous for its large Elephant and Buffalo herds with scattered pans and waterholes in the south. This part of Africa has vegetation that ranges from dense riverine and grass floodplains of the north to Teak forests and Mopane woodlands. Savute Elephant Camp is set amidst towering acacia trees on the banks of the Savute Channel in a rugged, semi-arid, wilderness region of the Chobe National Park. Accommodation is in 12 luxurious twin bedded tents with private timber decks. Spacious en-suite facilities have a 'his and hers vanity unit' and a dressing room area. Each tent is equipped with an electric heater, electric overhead fan, air-conditioning and mosquito net. One of the features of the camp is its specially constructed 'Elephant proof' swimming pool. Enjoy game viewing from the large deck of the airy central lounge and dining area or from open safari vehicles during morning and afternoon game drives. Wildlife that can be spotted includes a resident pride of Lion and rare Wild Dog. Savute is known for its exciting year-round game viewing and excellent birdlife. A treasury of Bushman rock paintings preserved at various sites just a short distance from Elephant Camp are a special attraction. Savute personifies the eternal contrast of Africa. Rain in this dry place is rare and water is precious. Situated on the mysterious Savute Channel, which is an eccentric waterway that fluctuates between being bone-dry or flooding, the whole ethos of Savute Elephant Camp is better understood with its inhabitants and environment. 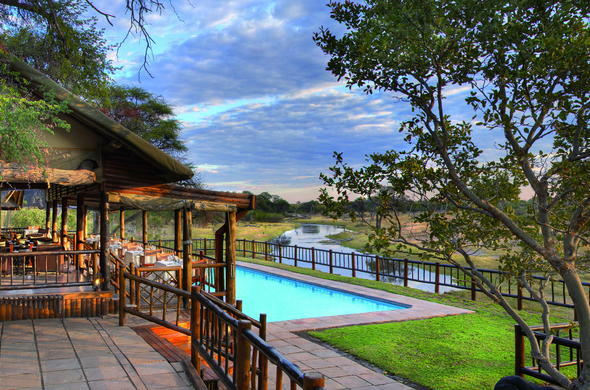 Savute Elephant Camp is set in a wilderness region of Chobe National Park. The surroundings can be viewed from private timber decks.